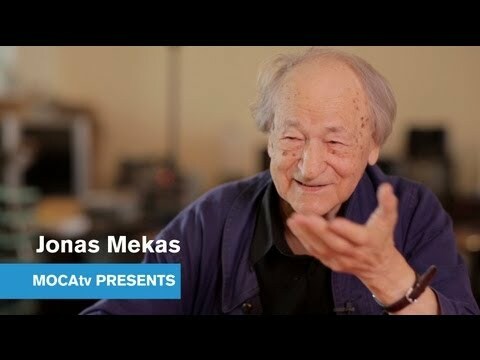 Film-maker, artist and poet Jonas Mekas was a leading figure of avant-garde and independent cinema. The Serpentine presented an exhibition of Jonas Mekas's film, video and photographic works from throughout his remarkable and prolific career. Mekas brought a poet's sensibility to the diary film style that permeates his work. Mekas' vision was unique in its ability to capture personal moments of beauty, celebration and joy. Developing his diaristic film style in the 1960s, he became best known for his 'film diaries' in which he recorded, with great sensitivity, his day-to-day activities as well as those of his peers from the film and arts community in New York. This exhibition surveyed Mekas's work with moving images, poetry and sound, presenting a selection of film and video works dating from the 1950s through to the time of the exhibition. The show included the world premiere of Mekas's new feature-length film, presented as an immersive installation. Stills, film portraits of friends and family and ephemera also punctuated the Serpentine's spaces, offering a fascinating insight into Mekas's life and work. On his arrival in New York in 1949, Jonas Mekas (b.1922, Lithuania, d. January 23, 2019) bought his first Bolex camera and began to record brief moments of the world around him. He quickly became a central figure in the burgeoning arts community, alongside friends and collaborators such as Allen Ginsberg, Andy Warhol and film-makers Kenneth Anger and Maya Deren. A tireless champion of the independent and avant-garde film movements, he wrote the 'Movie Journal' column in Village Voice, set up and edited Film Culture magazine with his brother Adolfas, and founded the Film-Makers' Cooperative and Anthology Film Archives. Presented by the Lithuanian Culture Institute in partnership with MUBI and Serpentine Cinema, this evening featured the pioneering film-maker Jonas Mekas in conversation with Hans Ulrich Obrist, as well as a screening of his 2012 film, Outtakes from the Life of a Happy Man. This event marked the publication of his latest book, Conversations with Film-Makers, (published by Spector Books) which gathered his many interviews for his weekly column in the Village Voice between 1958 and 1977.